AG has shown us a new Beforever character! On their book publisher’s website, the category, Maryellen, came up in the Beforever section. It didn’t show any books in the category though. I don’t know much about her, except for the fact that her life is in between Kit and Julie. Maybe 1950’s or 1940’s. She is probably coming out in August or June. August is my guess because last year around that time AG launched Beforever. Here is a leaked photo of a doll. I don’t know for sure if she’s Maryellen, but she may be. I like her hair. It’s darker than Spring’s. Her dress and gloves look dainty, as if she’s going to a garden party. 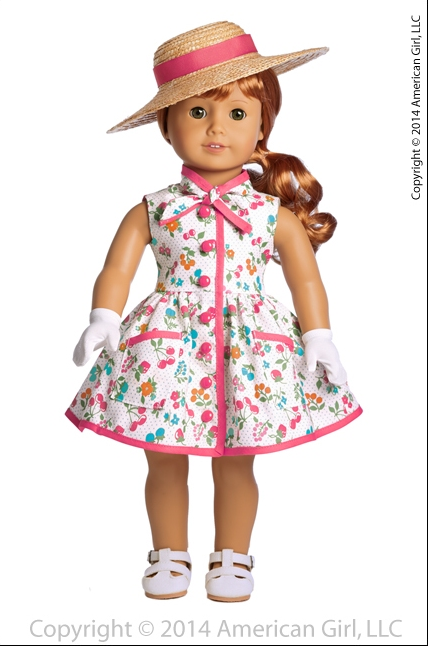 What do you think of this doll? She’s so cute! I love the dress! I wonder if she will be 1940’s or 1950’s? She’s beautiful! I definitely want her! I had no idea there was going to be a new Beforever character. What would I do without you, AG artist 🙂 . I REALLY want Mary Ellen. Hopefully I can get her for Christmas!